Providing you the best range of kids nightwear, kids tops, kids nightwear suit, kids clothing, cotton dress and kids jacket with effective & timely delivery. 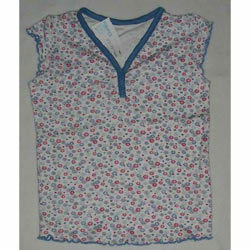 Our company is well known for its kids nightwear, which comprise of a top and a pair of pajamas. 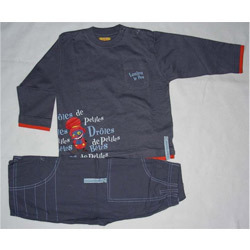 Designed as per the requirement of the clients, we utilize quality cloth material such as cotton, yarn and others to manufacture our range of kids sets. These are available in various sizes and colors and can be availed at affordable rates. 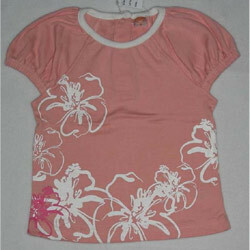 We have been offering a wide assortment of beautiful and cost effective kids tops. The dazzling color spectrum with incomparable cuts and stitches add additives features on them, which easily allure the attraction of the customers. We also offer kids tops with additional designs which are in accordance with the tastes of both contemporary as well as traditional designs. 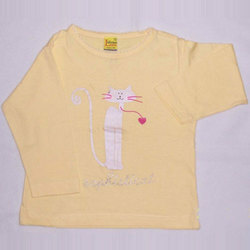 We are one of the leading manufacturer and exporter of kids clothing. We offer our kids wear as per customer requirements. 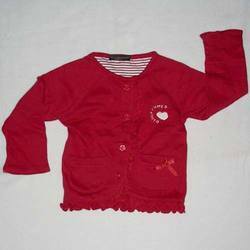 Our range of kids clothing includes kids gown, hooded t-shirts, kids hoodie, striped hooded t-shirt, knitted hooded t-shirts, camisole tops, knitted tops, halter neck tops, kids rompers, designer rompers, infant tops, kids tops, girls frock, kids full sleeve t-shirts, kids cotton frocks, kids knitted frocks, full sleeve hoodie, kids tank tops, kids polo t-shirts, kids basic t-shirts etc. We offer a wide gamut of jacket made of high quality fabrics that are easy to maintain and wash. They have contemporary designs and patterns and are manufactured in attractive colors. The fabrics are soft and stretchable to ensure that it does not cause any sort of rashes to skin. The jacket are designed in contrast and are also available in other variations as demanded by clients. We manufacture a complete dressing set with full trousers and tops. The pant and top are made of the finest fabrics. 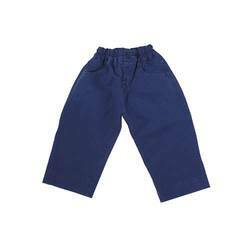 Our full trousers and tops come in standard fits for all ages of children. Our full pant top set makes for a beautiful dressing combination for lovely kids. Made using comfortable, soft fabric, these children dresses are available in different sizes. They can be customized on the needs of the clients. We are capable for supplying the various dresses in bulk quantity within committed time frame. 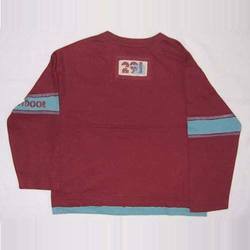 We are engaged in offering exclusive range of Knitted Tops to the customers at competitive prices. These tops are designed as per clients' preferences and current fashion trends by our team of experts. Moreover, these tops are made by using best quality fabrics, threads and other embellishments that are sourced from the trusted sources of the market. 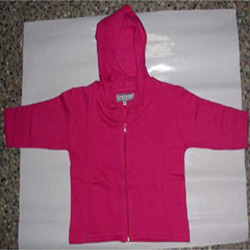 Made from extremely skin friendly fabric our kids hoodie are available in a wide range of colors. These kids hoodie t-shirts have a drawstring to tie them around the head. 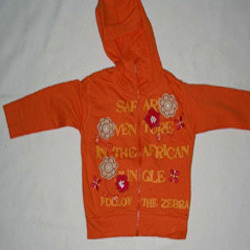 Clients can provide their specifications regarding size and prints.These kids hoodie are embellished with buttons and small patches designed in the shape of cartoon and animals. We offer a unique range of knitted hooded T-shirts that are offered in a host of colors and patterns. Manufactured using premium quality fabric, these knitted hooded t-shirts are a rage amongst the kids and are very trendy in appearance. 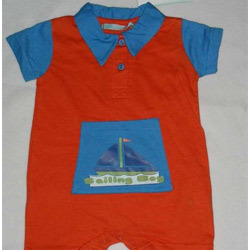 Our company offers wide variety of designer rompers that are made from quality fabrics. Durable and stylish these designer rompers are designed considering kid’s tastes and preferences in terms of colors and patterns. 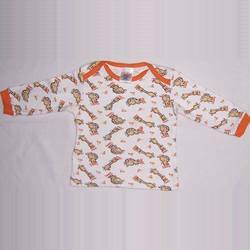 The kids wear are manufactured using ace quality soft and cushy fabric, keeping in mind the little wearer's soft skin. 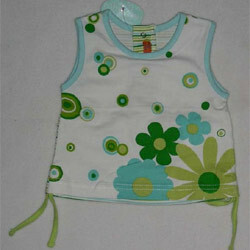 We manufacture rich collection of kids tank tops that are available in exotic designs and colors. We provide customized products as per customers requirements. 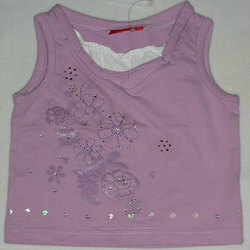 The sleeve and bottom of these kids tank tops are well-hemmed to provide finer finish. We source an enticing collection of kids sports wear in a spectrum of colors and designs. Our clients can avail these kids sports wear at industry leading prices and we also offer customized solutions to our range. Our range of kids short sleeve tops has carved a niche for themselves due to their intrinsic patterns and beautiful embroidery, print and style. 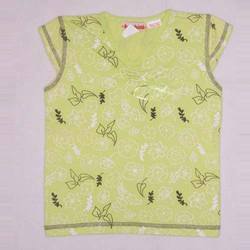 These kids short sleeve tops have been fabricated by our designers using classy range of raw material like cotton, silk and others. We ensure that the quality of our garments is stringently maintained and parameters such as intact stitching, colorfastness, durability of embellishment are checked before dispatch. Looking for Kids Wear ?